For other uses, see Spruce (disambiguation). Spruce are trees of the genus Picea, a genus of about 35 species of coniferous evergreen trees in the Family Pinaceae, found in the northern temperate and taiga regions of the earth. Spruces are large trees, from 20–60 (–95) m tall when mature, and can be distinguished by their conical form and their needles, that are attached singly to the branches in a spiral fashion. The needles are shed when 4–10 years old. 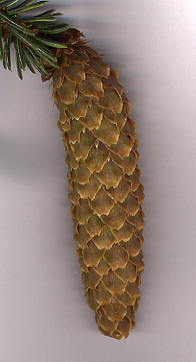 Wikimedia Commons has media related to Picea. This page was last changed on 4 February 2014, at 13:27.